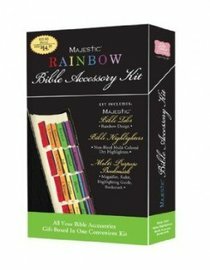 This Bible Accessory Kit includes everything you need for your Bible study or personal reflection time�colorful non-bleeding highlighters to mark your favorite passages: a magnifier bookmark for easy reading and to "note" your place; and index tabs to assist you in your Bible navigation�everything you need! Simply add your Bible and spend some time with God. About "Bible Accessory Kit Rainbow"